When you’ve read the book or seen the movie you would know how intriguing the story is. Piscine (also known as Pi) is a young man who grows up in a wealthy household. His parents are owners of the biggest Zoo in India. Pi has got it all, due to circumstances the family decides to sell most of the animals and move to Canada. On the way to Canada the family enters a storm, Pi, the only one awake, tries his best to rescue everything; but ended up being tossed out of the ship into a small boat. The ship sank with everything and everyone on it. Long story short Pi was on the very urge of losing his mind. He lost his family, animals, clothes, security – almost everything one could think of was gone. But through it all, he still managed to find the strength to concentrate on something more important. Okay, let’s get to business! There are two people I want us to look at, these two had amazing experiences and are fairly often mentioned. The bible speaks about the two, as if of no other. I’m speaking about Peter and Judas – two powerful selected disciples of Jesus Christ. Well to some Judas might be powerless I believe that this man, despite of what he did, still had abilities and the same power all the other disciples had. What I’m about to say is going to be very complex, but I encourage you to read this more than once and let it soak into your mind. It might save your life or the life others around you. Judas betrayed Jesus for thirty shackles of silver (Lukas 22:4) whereas Peter denied being a disciple of Jesus three times (Luke 22:34). Now you might think ‘what terrible friends Jesus had,’ but I’m sure we all have met people like this before! Anyone could sing a song about “fake friends”, yet the significant part here is not the “bad thing” they both did, but how each one of them coped with what they did. When you’ve read both stories before – you know that Judas killed himself and Peter became one of the many writers of the bible. When I read both stories over and over again I asked God – Why did Judas kill himself and Peter become so great? I know that Jesus mentioned that he would build his church upon the rock and use Peter for it (Matthew 16:18), but it still didn’t answer my question. After a thoughtful conversation the answer was clear. HOPE; it was HOPE that kept Peter alive and it was HOPELESSNESS that killed Judas. Let me go a little deeper… Peter swore to do anything for Jesus he was convinced in his own power to be strong enough for death. Matthew 26:35 – KJV – “Peter said unto him, though I should die with thee, yet will I not deny thee.” Strong words, however, this never happened. At the time Peter had the chance to stay behind Jesus his boldness vanished and he cursed himself denying knowing Jesus at all. I want you to stop right here for a second and to ask yourself this – Are you loyal to your own words? Judas – from the beginning had a different picture of Jesus. Judas was one of those Jews that thought Jesus would come, take over Rome and build Himself a Kingdom on earth. This was one of the reasons why most Pharisees could not get along with Jesus’s philosophy. The picture they had about their Savior did not match with the things Jesus did. Judas was handling Jesus’s money, which would have given him a powerful position if Jesus would have over thrown Rome. Well, this did not happen, Judas went on and betrayed Him. Remember when I mentioned that no one should believe that his life is destined for failure (Read my last blog entry if you haven’t – it’s good)? Here’s the perfect example for this, even though they both had to deal with the heaviness of guilt and the consequences that came with denying and betraying Jesus; Peter managed to find hope in a hopeless situation; Judas went away and hung himself (Matthew 27:5). How is it that one keeps and the other forsakes it? It’s simple – it’s a heart issue. For the eyes of the Lord range throughout the earth to strengthen those whose hearts are fully committed to him… (2 Chronicles 16:9 – NIV). God is a living God and if you believe this fully within your heart anything that appears to be dead in your eyes has to come alive. Peter’s heart wasn’t turned against Jesus even though his words were different. Judas’s heart was completely turned against Jesus, which is why he didn’t stay alive. It is within our hearts where we find the courage to keep dreams, love, and power alive. Above everything else guard your heart, because from it flow the springs of life (Prov. 4:23 – ISV). 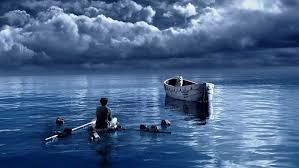 Peter could have drowned in self-pity, guilt and the loss of hope but he didn’t. In his heart he was determined to stay alive because he knew who Jesus was. Do you know your God? As tough it could get there is hope found in any hopeless situation. I want you to reconsider your situation/s and seek for the loophole. God isn’t overlooking you, as a matter of fact, He is always with you! I’m not sure how this affects you, but when I read Pi’s words it sparked something significant within me. His words gave me hope again. Hope to care, hope to love, hope not to give up, hope to keep going… it gave me hope in so many aspects that I’ve decided to write about it.